Begin by peeling and slicing the ripe bananas and placing them on a non-stick metal baking sheet for easy freezing. 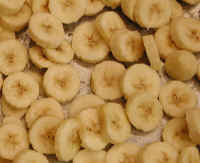 Place the baking sheet in the freezer for about six to eight hours to ensure that the bananas are frozen solid. Once frozen, we use a plastic spatula to loosen the banana pieces from the metal sheet. The frozen pieces can be stored in a tightly sealed plastic container in the freezer for about a month. 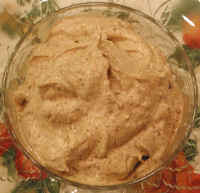 We prepare the banana raisin coconut spice cream in a high powered blender, such as a Vita-Mix. Scoop the banana raisin coconut spice cream into individual serving bowls. No topping is necessary. Serve "as is" to appreciate the flavor.